On the menu today, three fresh ingredients picked up at our local French farmers market and 4 dish ideas. Walking at the farmers market is like walking thru a live painting, rich in colors with the added bonus of an abundance of pleasant aromas. 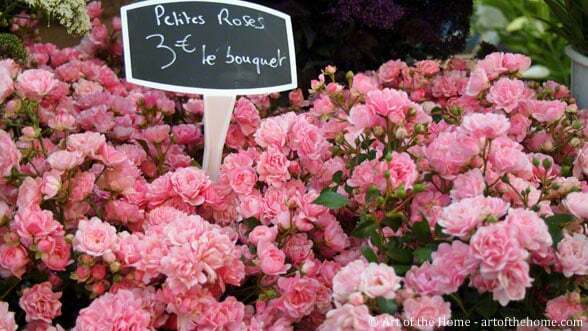 And you have a lot of options in France, there is always a farmers market somewhere! Depending on where you live, you can find a farmers market daily, weekly or if you leave in a more rural area, you just pay a visit to the farmer and get fresh vegetables, fruits, chicken and eggs right there at the farm. 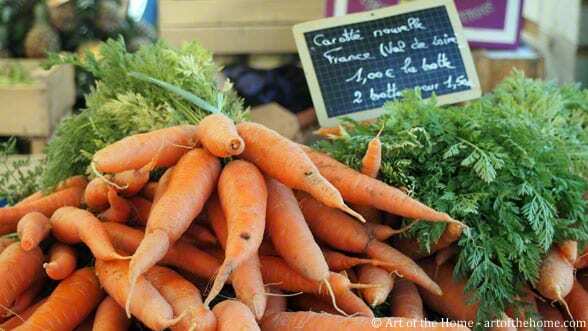 Farmers markets are both practical and cultural in France. French women (and men) go the farmers market to eat in season (a big part of the French diet) and also find regional products. In fact, at the dinner table, it’s not uncommon to discuss where the ingredients came from — it’s a nice topic of conversation and a way to transmit tradition and heritage to the younger generation. At dinner parties, it also gives great joy to the hosts to serve local products (and the guests feel really special too!). Going to the farmers market is also an activity to share with family or friends. So would you join us at the Farmers market today? Simply check out our Art of the Home farmers market pictures, dish ideas, as well as our farmers market notes below. 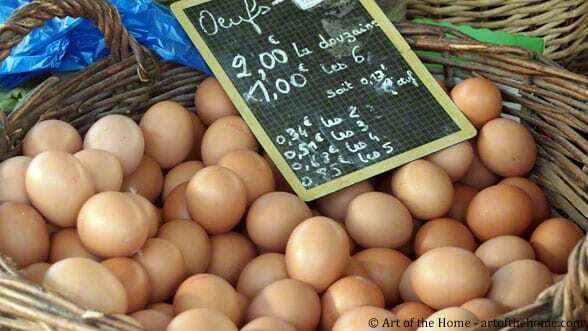 Fresh organic eggs à la carte – you can buy 2 or 12 eggs and anything in between. Art of the Home notes from the farmers market — at today’s currency rate, the cost of a dozen egg is about $3. So how about an easy omelet or an oeuf à la coque-mouillettes for dinner? Art of the Home notes from the farmers market — at today’s currency rate, the cost of one “botte” (about 6 carrots) is about $1.50. Those carrots are so flavorful that they make tasty braised carrots to accompany a chicken roast or pork roast. Fresh cherries: those Burlat cherries are common on French tables and offered for dessert in a small bowl as is or in homemade cakes. 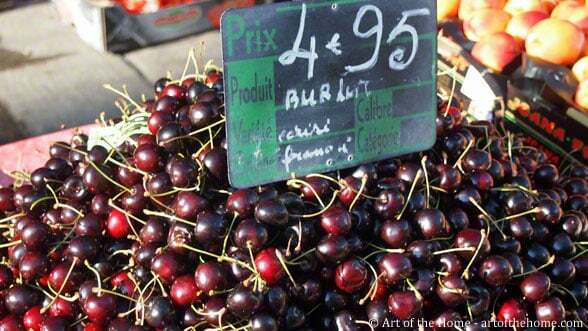 Art of the Home notes from the farmers market — at today’s currency rate, the cost of those Burlat cherries, the most cultivated in France, is about $2.25, what a bargain! So how about a clafoutis for Sunday dessert? And before leaving the farmers market, let’s pick up a country flower bouquet. No matter how small, it brings sunshine in your house and your spirit too!